Next month, England host a round of the Women’s 7s World Series in London but there is much work to do for the side in Canada this weekend. Captain Abi Chamberlain gives us an overview of with the goings on within the camp and the squad’s progress. "So far in the World Series, we have demonstrated our ability but we haven’t yet got the results we would have wanted. There is no point in hiding from that, we could dress it up all we like but we have to realise we have got some hard work to do in the next three tournaments and must be more consistent throughout each one. In the first and second round of the circuit in Dubai and Brazil we won silverware by winning the Plate Final but this is really a consolation prize as the main event we want to be involved in is the Cup. Since dropping out in the quarter final stages in Atlanta we have been working on a couple of elements we fell short on. Our main focus is in defence, correcting areas where we were vulnerable and avoiding positions where teams can attack us from. We know this weekend in Canada (on 18th and 19th April) that we will be pushed hard, especially against teams towards the top end of the standings and we want to be more organised and cohesive in defence. Also we need to train our focus to be consistent performers. We have proven time and time again that we have the ability to play world class rugby, what we haven’t yet proved is that we have the ability to play six games of world class rugby on the bounce. When we are in camp we would be in on a Monday morning around 08:00, for a stretching session to loosen up and get ourselves going for the day. We then have a training session of either rugby or strength and conditioning around 09:00. Following this we grab some food, people have meetings, reviews and performance analysis and it’s an opportunity to speak to the strength and conditioning coaches or nutritionists. We have a block in the middle of the day where we chat about lineouts or plays off scrums. We then have another rugby session in the middle of the day, usually around 14:00 doing running or fitness, although this does vary. We have Wednesday as a recovery day then the weekend will differ. Sometimes we will have 15s club games to play and if we don’t, we will have a top up session to do on one of those days. We are all together Monday, Tuesday, Thursday and Friday. Selection is entirely based on Simon (Middleton) and it is made very clear throughout the week at training that we are playing for places. We play with our positional competition day in day out so I would know who is hard on my heels similarly to girls in other positions. I wouldn’t say there is anyone in the squad who wouldn’t be nervous when the squad goes out. Out of a group of 20, there aren’t 12 great players; there are 20 great players which is a good position to be but it does make it a pretty nervous affair when the squad is announced! We are currently at the half way stage of the Women’s 7s World Series having already played in Dubai, Brazil, and the USA. With the fifth round on home soil at The Stoop and Twickenham Stadium in May, we as a squad are hugely excited to play in front of a home crowd and our club team mates, friends and family." 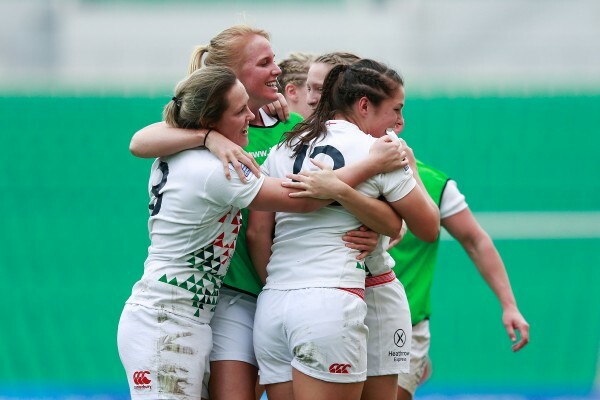 England women will be playing at The Stoop on Friday 15th and Saturday 16th May in the penultimate round of the Women’s 7s Series. To book tickets please click here or call 020 8410 6010. Abi Chamberlain is captain of the England women's sevens team and is one of the 19 players who were awarded a professional rugby contract with the RFU in September 2014.